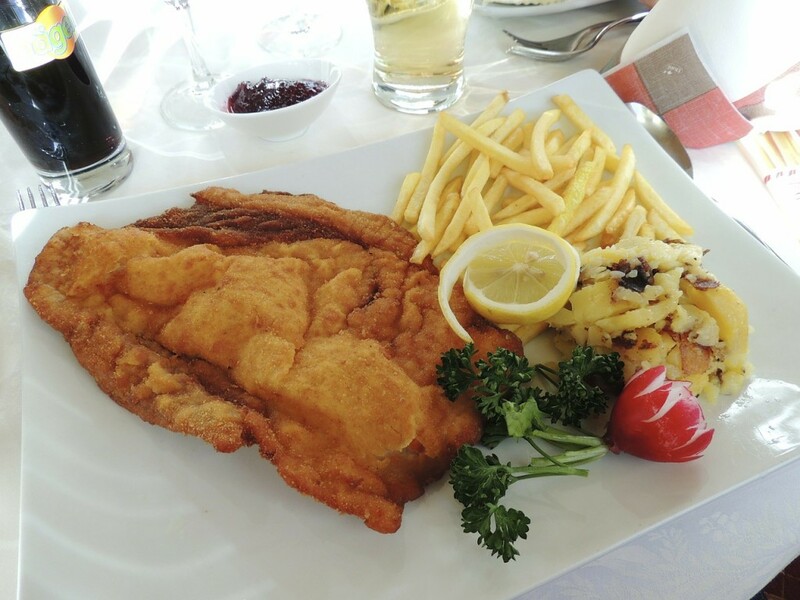 When you think of Austrian food, what comes to mind? Sacher Torte? Knodel? Perhaps one of the delicious cookies, like the linzer tarts with jam filling? At our house Austrian meant Schnitzel with red cabbage. Most commonly made with pork or veal, we eventually switched to chicken. Boneless, skinless chicken breasts, cook in just a few minutes. My husband was the master of this process. One of the secrets is slicing the chicken into thin butterfly pieces. You can pound them to make them evenly flat once you have butterflied them. Then be sure to coat them thoroughly in each stage, so every part is covered, first with the flour, then the egg mixture, then the bread crumbs. Don’t forget the lemon wedges! Lemon is delightful squeezed onto the finished schnitzel. Traditionally, we would serve the dish with potatoes and tangy cooked red cabbage. You will often find it served with fries. Either way it is a satisfying, tasty dish that you will want to make again soon. Dredge in flour then set aside. Combine eggs, 1 tablespoon oil, paprika, salt and pepper, mixing well. Dip floured chicken breasts in egg mixture, then immediately into bread crumbs, coating evening. Heat ¼ cup oil in a large skillet. Cook chicken breasts until lightly browned on one side, then flip, 3 to 4 minutes a side. Drain on paper towels while cooking the rest. Serve hot with red cabbage and mashed potatoes, or as pictured here, with french fries. Garnish with lemon wedges to squeeze on the schnitzel. I highly recommend this skillet for a dish like this. Mine is well over a decade old, yet still looks like new. Calphalon is so durable, nice and heavy for even cooking, and very easy to clean when you are done. This particular pan is 14.5 inches across. A large size that is perfect when you are sautéing. It comes with the lid too, of course. The high sides make for neater frying too. Handy too for cooking cabbage, spinach, or any food that is bulky until it cooks down. It’s a favorite.